With the ongoing spate of food safety scandals, Chinese consumers are rightly weary of the source and quality of their food. Unfortunately, food quality regulatory bodies in China remain unreliable and direct access to fresh food sources is limited for an increasingly urbanized populace. This is one of the great contradictions of China’s urban development: a country which for most of its history was majority agriculturally based is on the fast track to be one of the most urbanized nations in the world. Status conscious Chinese urbanites would rather not associate with anything related to farming, as it evokes the recent memory of rural peasant life. For many upwardly mobile city dwellers, international restaurant chains like KFC, McDonalds and Pizza Hut are considered the best options for upper-class ‘healthy’ dining (that is, food with high caloric content). The urban growth of China is a boon to these chains as more American consumers shun them in favor of a more organic, natural diet. The shift in American consumer preferences is reflected in the success of supermarket chain Whole Foods, local farmers markets, and the growing popularity of the Slow Food movement. Given China’s new-found love affair with processed food and growing ambivalence about the role of agriculture, I was confident there was probably not much interest in organic farming. 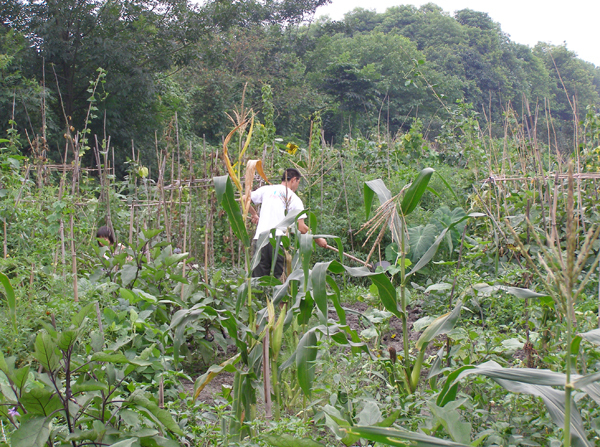 That was until I visited Anlong Village- a wholly organic, zero waste farm 50 km northwest of central Chengdu. With a full-time population of 3,000 residents, Anlong Village is sponsored by the Chengdu Urban Rivers Association (CURA), a local non-profit NGO. Anlong Village is CURA’s flagship project, and unlike other purported ‘eco-cities’ under development in China, lives up to its claim of being 100% sustainable. 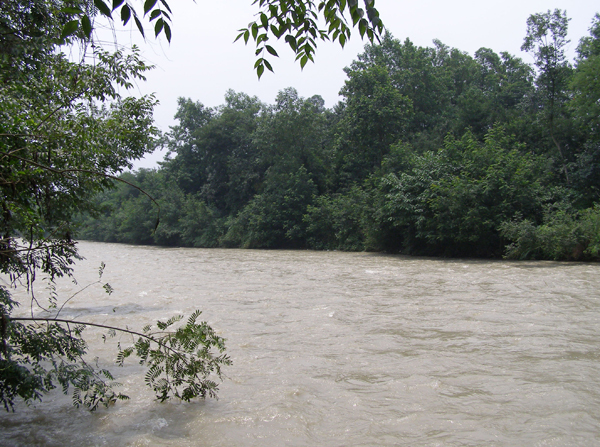 The partnership was established in 2003 as an effort to help clean up the adjacent Funan River, which flows through central Chengdu, after it was discovered that most of the river pollutants come from agricultural runoff upstream. Anlong helps abate this problem by avoiding the use of chemical pesticides and instead using natural methods to fight agricultural pests. These methods include surrounding plots with mint (a natural pesticide) and planting garden plots with a variety of different species (so if one crop succumbs to disease, it does not destroy the entire plot). This not only avoids dumping unnatural chemical waste into the river, but ensures that the farm’s soil is nurtured over the long-term. The village also features a comprehensive composting system. Composting toilets turn waste into organic fertilizer and animal waste is recycled into concrete pits treated with anaerobic digestive microorganisms that convert it into methane gas used for heating and cooking. Plant waste is also re-used as organic fertilizer. Throughout the village, greywater is treated in a series of specialized ponds that naturally remove pollutants. 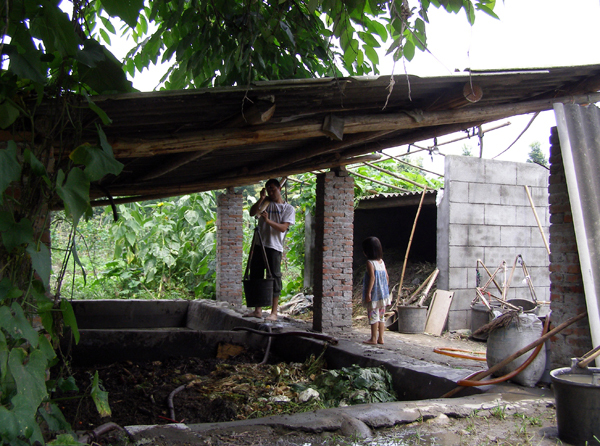 Treated greywater can then be re-used for agricultural irrigation. Constructed wetlands adjacent to the Funan River also treat greywater, assuring that potentially harmful waste water is filtered before entering the river. Despite the initial apprehension of local government officials, Anlong Village is a tremendous success. Of the few plots available to non-Anlong residents (primarily health conscious families living in the city who tend to their crops on the weekend), demand outstrips supply. Demand is also great for the organic produce grown in Anlong. This is in large part due to Chinese consumer mistrust of the validity of produce labeled ‘organic’ in large Chengdu supermarkets like Wal-Mart, Carrefour, or Isetan. Anlong, on the other hand, offers a trustworthy source. Unfortunately, at this point there are very limited formal distribution channels for purchasing organic produce grown in the village. Farmers frequently venture to the city to sell their crops, but usually only those ‘in-the-know’ will know when and where exchange points are. To make it a bit easier for consumers, CURA is currently in the process of training Anlong farmers how to use microblogging sites to announce the time and location of exchange points. In its relatively short history as a 100% organic farm, Anlong Village is already a benchmark for other aspiring sustainable farms around China. Yet like in the U.S., there is ongoing debate about the scalability of such a model. Considering the high markup on price compared to commercially farmed crops (produce grown in Anlong can be two to three times the cost of commercially farmed produce), many argue that this method of farming is not practical to feed a nation with such a huge population as China. In spite of this debate, and given China’s struggle with pollution as it continues to develop, Anlong Village is a blessing and a valuable reminder that practical steps can be taken to protect its environment.